Heading to another appointment one morning, our driver avoided Quezon Boulevard and the Quiapo area, which we learned later had serious flooding at the underpass. Our driver said we were actually waved off by a traffic enforcer from heading into Quezon Blvd. to head instead towards Morayta and Recto. And so I decided to take some new photos along our way, which took us to Morayta, Recto, Legarda, P. Casals and Ayala Blvd. Morayta Street with the Far Eastern University (FEU) at right is part of an area that is called the University Belt because of the academic institutions located in the area including several major universities like FEU, the University of the East (UE), the University of Sto. Tomas (UST), San Sebastian College, San Beda College, Centro Escolar University and College of the Holy Spirit. On-street parking along Morayta Street – there should be parking fees for such spaces in Manila since vehicles significantly reduce road capacities and cause congestion. These streets are public spaces and should benefit the general public and not just a few people who happen to have cars but no parking space in an area where space is very limited and therefore valuable. Approach to intersection of Morayta with Recto Avenue. Recto Avenue eastbound with the elevated tracks of the LRT Line 2. Approach to the intersection of Recto with Loyola Street. San Sebastian College is just after the signalized intersection. The pedestrian crossing is for people crossing to or from the University of the East, which is on the other side of the road. The alignment of the LRT Line 2 led to its posts dividing the eastbound lanes of Recto for the section between Loyola Street and Legarda. San Sebastian College is at right with its arcade walkways. The divided eastbound lanes of Recto merge at the approach to the intersection with Legarda and Mendiola. That’s Mendiola from across our turning vehicle with San Beda College on the left and a branch of Jollibee obscuring a view of Centro Escolar University at right. 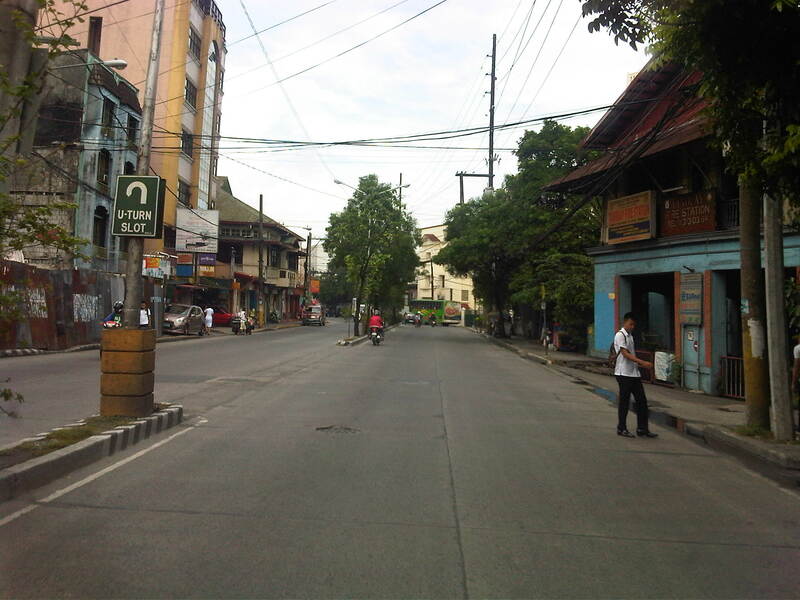 Southbound lanes of Legarda in the general direction towards Arlegui Street. There are many new buildings along the street including the one on the right, which replaced what were already decrepit buildings and houses. Some of these houses probably had historical value but were demolished nonetheless after the property was sold to more enterprising people. A peak at San Sebastian Church from Legarda and downstream along Bilibid Viejo Street. This image has been captured in many photos and drawings from the time it was completed during the last years of the Spanish period, to the American period until the present. Legarda ends at its intersection with Nepomuceno and Concepcion Aguila Streets where the most prominent landmark is the National Teachers College. Here, Legarda becomes Nepomuceno and proceeds towards Arlegui and P. Casals. By d0ctrine in Heritage, Highways and Streets, Land use on July 20, 2013 .